Bog-rosemary on Calvert Island. Photos by Julia Fisher (top left) and Nancy Shackelford. 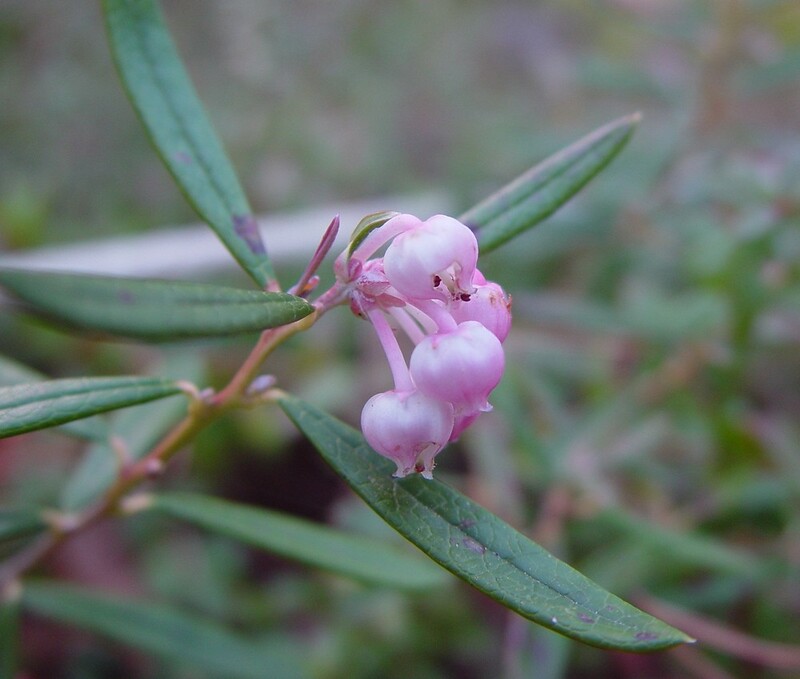 When in flower in the spring and summer, bog-rosemary is easily identified by its pink, urn-shaped flowers in clusters of 2-6, which often face downwards. It grows to 80 cm tall and has dull-green leathery leaves with the margins rolled under. The undersides of the leaves are white with a fine, waxy powder. 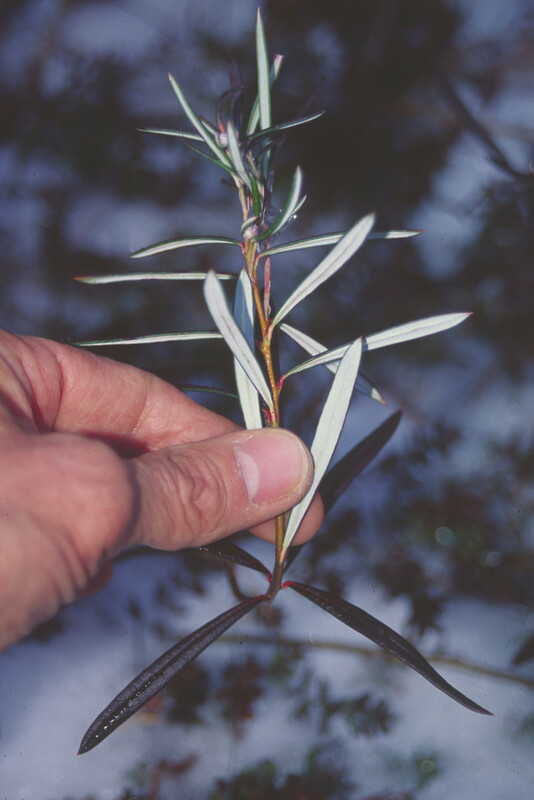 The leaves appear similar to several other species in the region on the surface, so the undersides can be an important identifying feature when the plant is not in flower. 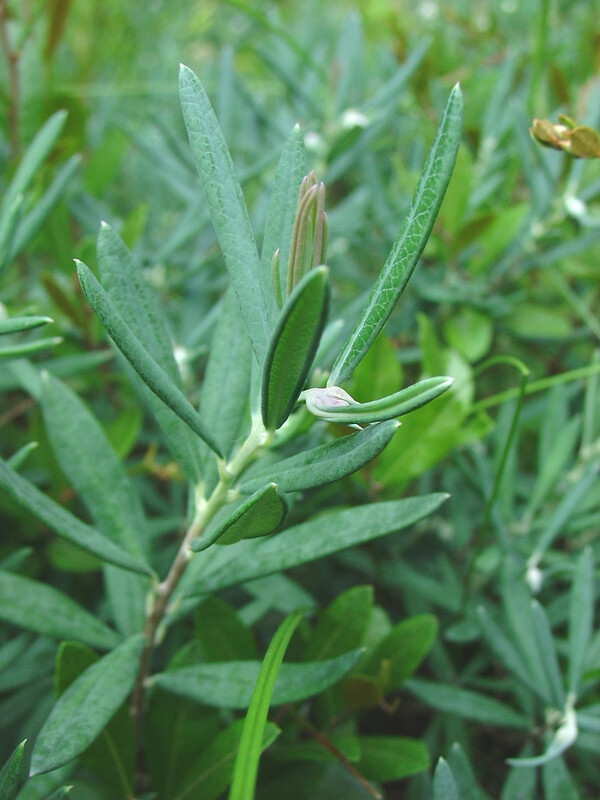 Bog-rosemary does not lose its leaves in the winter. 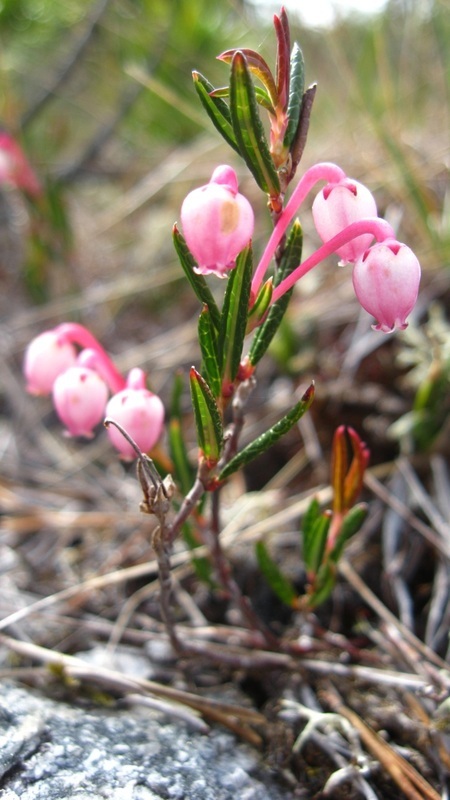 The plant is found, as the name suggests, in bogs, fens and swamps from low to subalpine elevations. The species is found all along the BC coast, north to Alaska and east across northern and parts of central Canada. It is circumpolar and so is found in northern Eurasia as well. 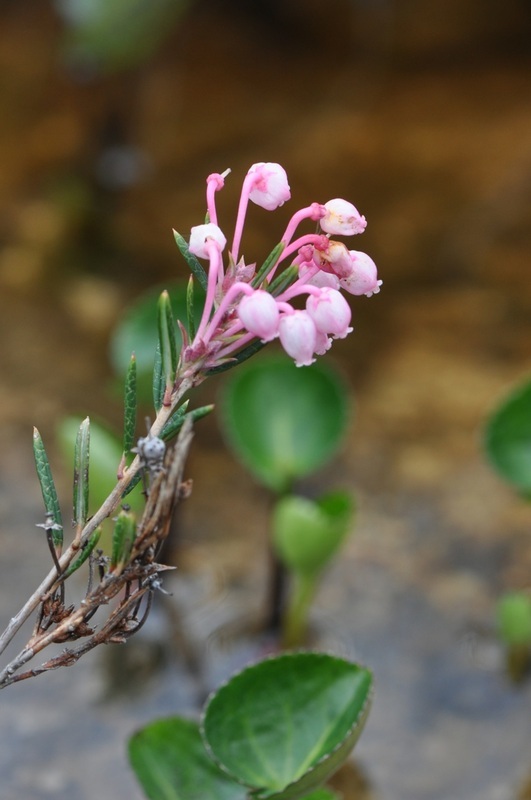 The species is poisonous, like western bog-laurel (Kalmia microphylla ssp. occidentalis). Both contain the compound andromedotoxin, which causes breathing problems, dizziness, cramps, diarrhea, and lowers blood pressure. Care must be taken not to confuse these species with Labrador tea (Rhododendron groenlandicum), which is commonly used to make tea. 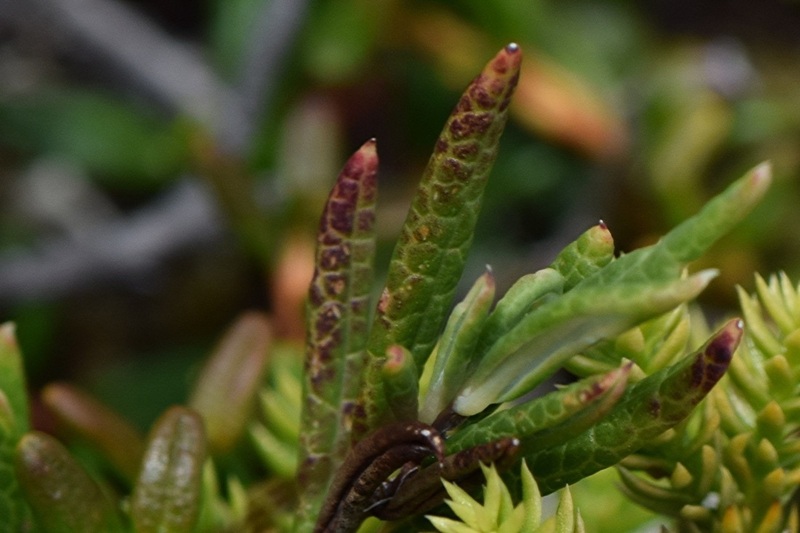 Labrador tea has rusty brown hairs on the undersides of leaves, as opposed to the white hairs of western bog-laurel and the hairless leaves of bog-rosemary. The beauty of bog-rosemary has made it a common garden ornamental plant, with numerous horticultural varieties including 'blue ice'. Anonymous. (2013). Andromeda polifolia L.: bog rosemary; bog-rosemary. In Klinkenberg, Brian. (Ed.). E-Flora BC: Electronic Atlas of the Plants of British Columbia [eflora.bc.ca]. Lab for Advanced Spatial Analysis, Department of Geography, University of British Columbia, Vancouver. Accessed on 02/11/2013. Pojar, J. and MacKinnon, A. (2005). Plants of Coastal British Columbia, Revised. Vancouver, BC: Lone Pine Publishing. P. 65.